Tired of all the sugary Halloween treats? Try sprucing up a healthy dinner for the kids. My one-year-old son loves grilled cheese so I put together these cute jack o'lantern style open faced sandwiches. Older kids can assemble them on their own. It's a good way to have fun with veggies and a simple tasty dinner when mom is busy! Place slices of cheese on bread slices. Cut with pumpkin shaped cutter. Slice veggies in a variety of shapes. (see photo for ideas). Let kids decorate their Jack o'Grilled cheese with assorted veggies. Place on rack in toaster oven or regular oven. Remove when cheese is melted and enjoy when cooled off enough! 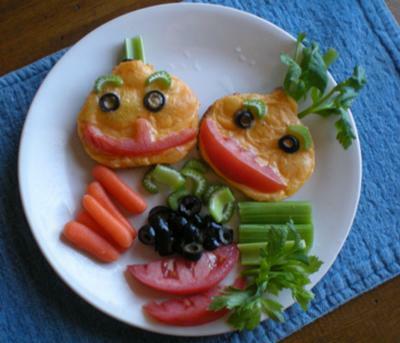 Here's a tip - cut extra veggies and let kids play around with the faces for a while before cooking. Otherwise, they will want to make 3 or 4! Great picture of your healthy halloween recipe.